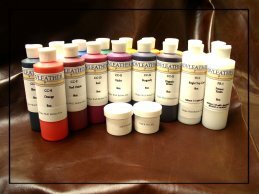 The leather repair and restoration products listed on this page are intended for use by trade professionals who are familiar with the processes and practices involved in the leather repair and restoration business. The reason that we've separated them from our other product offerings is that they are shipped with only minimal documentation, and knowledge of their usage and application requirements is assumed. If you are not involved in the leather restoration trade, but are looking for do-it-yourself solutions to common leather problems, please visit our DIY homepage. Product Description: Starter kit containing all chemistry necessary to make repairs and small project restorations on leather items. This kit does not contain any application tooling. It is designed for those who already have some experience in leather repair/restoration, and who are looking for an better alternative to what they are currently using. The price for the core chemistry kit is $375.00, which represents a 15% savings over the items purchased separately. For a complete list of the kit contents, click here. Product Description: Pigmented, water-based, blended-resin coatings specifically designed for upholstery-grade leathers. Can be rub or spray applied. Very flexible, with a low profile, excellent break characteristics, and good coverage. If you'd like to view the Product Description and Application sheet for these products, click this link. Color Description 8 oz. 16 oz. Qt. Gal. Product Description: Clear, water-based urethane or blended resin coatings. Used for final coat over color coating to assure desired sheen, and to provide maximum wear-resistance. All are UV stable, flexible, and have good chemical resistance. If you'd like to view the Product Description and Application sheet for these products, it can be found here. Description 8 oz. 16oz. Qt. Gal. Product Description: Can be added to color-coatings at a specified ratio, allowing for a rub-on color application that does not need subsequent clear-coat application. Great for in-home color enhancement and restoration, without the need for extensive taping off or spray equipment. If you'd like to view the Product Description and Application sheet for this product, it can be found here. Description 8oz. 16oz. Qt. Gal. Product Description: Additive for color- and top-coatings to increase chemical and water resistance, as well as wear resistance. Cross-linker is typically added at a 2-5% ratio into the application mixture. Description 2 oz. 8 oz. 16oz. Product Description: Non-resinated additive for color- and top-coatings, as well as RCA, to lower reflective value. Duller concentrate is typically added in at a 5-10% ratio to the application mixture. Adding Duller concentrate in excess of 10% can affect the cohesive properties of the film. Product Description: FC-1-3 are water-based fillers, used to eliminate voids associated with damage or defects in leather. They are specifically formulated for maximum flexibility, longevity, and ease of use., and are wet- and dry-sandable. VRC is a plastisol, used to repair damage on vinyl or other synthetic materials. It is heat-cured, and remains flexible over time. It is not for use on leather. Product Description: PR-1 is a water-based resin used in conjuction with denatured alcohol to ensure adhesion on leather surfaces prior to repairs or color application. PR-1 is appropriate for all types of leather, including problematic leathers such as nitrocellulose finished, pull-up, oil-tanned, or pH damaged. Another attribute of PR-1 is it provides hold-out when finishing open-pored leathers, such as full- or semi-aniline, to retain softness and break characteristics. It can also be used on finished leathers, to promote adhesion on leather surfaces exhibiting signs of poor adhesion such as peel-up or flaking, or leathers that fail adhesion tests prior to repair compound or finish application. It is supplied in concentrate form, and should be mixed at a 1:3 ratio with denatured alcohol. SG-4 is an economical one-step cleaner, pH corrector, and primer for all types of leather surfaces that is supplied ready to use. Both primers can be used when converting a nubuck leather to a finished leather, but neither product should be used on suede. If you'd like to view the Product Description and Application sheet for these products, choose the appropriate link. Product Description: Water-based blended resin, used to re-create grain pattern on leather after fill compound application. Designed for spray application. Flexible, and wet- and dry-sandable. Product Description: Used to remove oils from leather in areas saturated with human or pet body oils. Usually the result of repeated, extended exposure, oil saturation is most commonly found in headrest, arm-front, or seat-top areas, and represents as a concentrated darkening of a particuar area. If you'd like to view the Product Description and Application sheet for this product, it can be found here. Please note - The use of oil extractor will most likely bleach the color from the area treated on unfinished leathers, and will require subsequent color application to fully restore the area to the original aesthetic. If you are not a leather repair technician, we recommend contacting us prior to purchase so that we can help you establish a restoration strategy after the oil extraction process. Product Description: Can be used as a barrier coat to prevent low concentrations of oil accumulation from tackifying or plasticizing subsequent finish applications. Not recommended for use over heavy oil accumulations, where oil extraction is needed. Product Description: Moisturizer is designed to re-instill moisture into dry and/or stiffened leather. It is not effective unless it can penetrate into the fiber structure, so use on finished leathers is not recommended unless finish can be removed prior to application, or product can be applied to the suede side of the leather. It is very effective in restoring moisture content, and softening stiff, aged leather (particularly anilines, pull-up leathers, and nubuck leathers). Moisturizer is for spray application using either HVLP or a pump sprayer. Product Description: Moisturizing Gel is designed to re-instill moisture into dry and/or stiffened leather. It is not effective unless it can penetrate into the fiber structure, so use on finished leathers is not recommended unless finish can be removed prior to application, or product can be applied to the suede side of the leather. It is very effective in restoring moisture content, and softening stiff, aged leather (particularly anilines, pull-up leathers, and nubuck leathers). Moisturizing Gel is for rub-on application. Product Description: Written by our general manager Kevin Gillan and our senior technician Jason Murray, this document has recently been expanded to over 300 pages, and is the most comprehensive and exhaustive guide to leather repair and restoration in existence. It also includes links to external resources, such as task-specific YouTube videos. Covering types of leather, the repair process from start to finish, color matching, color theory, oil extraction, stitching, and much, much more, it is an invaluable tool for technicians at all skill levels. It is available in both electronic and printed versions. The electronic version will be delivered via email, and the printed version via traditional shipping. If you've previously purchased the Leather Technician Field Guide, learn how to upgrade to the Comprehensive Guide for free, or at a dramatically reduced cost. E-mail Kevin for details. Product Description: We offer a custom color-matching service. Have a project that requires a specific coloring strategy that has presented a challenge, either from a time-commitment perspective, or a technical specificity that is driving you nuts? We offer our 29 years experience to help you get the job done. Whether a single color match, or a mottled color effect (also referred to as sauvage, or base-and-print colors), we can get you the color for your project on a cost-effective time-line. For a single color match, the color-match fee is $60, plus the cost of the material ordered. For a mottled color match, the color-match fee is $75, plus the cost of the material ordered. To use our color-matching service, we would need either a sample of the leather that you are trying to match sent to us, or a color code from any of the Benjamin Moore® color samples or color books. If you are not a leather repair technician, and are looking for a DIY option to restore a leather item, please visit our DIY homepage.